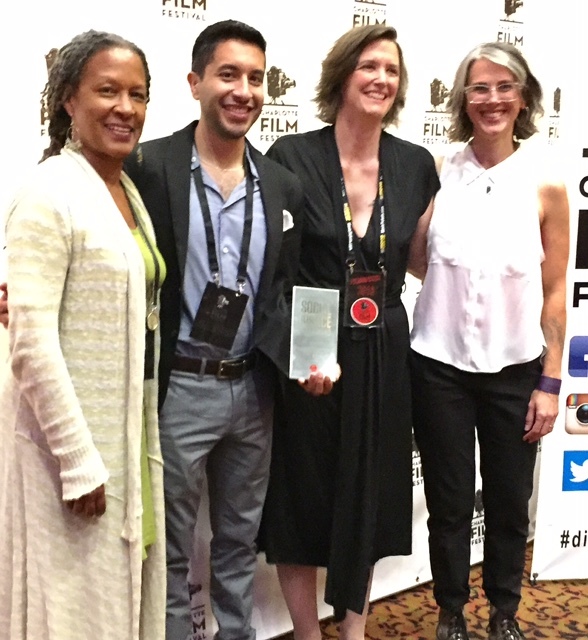 The SPLC recognized the documentary film Forbidden: Undocumented and Queer in Rural America with its first-ever filmmaking award at the eighth annual Charlotte Film Festival in North Carolina on Saturday. The Social Justice Award, presented in partnership with the film festival, recognizes an outstanding film that seeks justice, enlightens and informs an audience about people who are marginalized, devalued or vulnerable in society. Forbidden, a feature-length documentary, follows the life of Moises Serrano, a young, gay undocumented immigrant. From left to right: Lecia Brooks, SPLC Outreach Director, Moises Serrano, Heather Mathews, and Tiffany Rhynard. The SPLC, which has won two Academy Awards for its Teaching Tolerance films, hopes the new award will encourage other filmmakers to seek out important social justice stories and bring them to the screen where they can educate and inspire audiences to take action. In Forbidden, viewers learn that Serrano, an immigrant rights activist living in North Carolina, emigrated with his parents from Cancun, Mexico, when he was 18 months old. His parents picked tobacco and strawberries for a living. They later moved on to work in chicken houses as he lived a typical American childhood in rural Yadkin County, North Carolina. Growing up, Serrano found himself rejected by both Mexican-American peers who viewed him as “too white” and white classmates who bullied him for being gay. He now travels across his home state speaking to community groups and lawmakers on behalf of undocumented immigrants. The film stands out for its depiction of how the United States depends on the labor of immigrants like Serrano’s parents, Brooks said. Serrano’s family was systematically marginalized and denied vital services like drivers’ licenses. Serrano calls it “psychological warfare.” Depression, he says in the film, can settle over undocumented people as a result of living in fear. “Moises embodies the lived experience of the Dreamers,” Brooks said, referring to the young people who could benefit from the DREAM Act, a proposed law that would provide undocumented minors with provisional residency and eventually permanent residency after meeting certain conditions. The film makes clear that an immigration policy based on executive orders from the president isn’t enough. Serrano’s family needs comprehensive immigration reform that would provide relief for his 33-year-old sister as well as his parents. The film raises awareness of issues faced by undocumented immigrants when it comes to driver’s licenses and access to college education. Serrano also turns the camera on his family life to showcase moments such as hikes with the children, opening presents on Christmas Eve and his boyfriend learning to cook. Forbidden will screen at festivals around the country throughout October. Director Tiffany Rhynard hopes for wider distribution. The film recently secured an online educational distribution contract with Kanopy, a streaming service accessed through college and university libraries. Wider distribution could increase awareness of issues undocumented immigrants face, but also the work and lives of activists like Serrano.